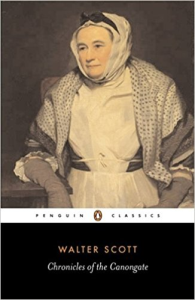 "Chronicles of the Canongate" is a collection of stories by Sir Walter Scott, published in 1827 and 1828. They are named after the Canongate, in Edinburgh. The MacTavish family lived near Oban in 1775. Hamish MacTavish Mohr ("Senior"), a daring freebooter, had met his death in an encounter with the Saxon red-coats, by whom the Highlands were garrisoned after the battle of Culloden. His wife, who had shared all his dangers, strove to inspire their only son with his father's love of adventure and hatred of servile toil; but as he grew up the lad evinced no inclination for lawless pursuits, and, unable to endure his mother's taunts at his want of spirit, enlisted in one of the regiments formed in Scotland to oppose the French in the American war of independence.